Donald Takayama's IN THE PINK noserider. Hot acid wash abstract swirl bottom & rails, clear deck inlay in a gloss & polish finish. Black and white lo-profile oval and ocean tern logos, black full body pinlines around the deck inlay. Single 3/8" Redwood stringer. Nice butterfly style tail patch. 2+1 setup; FCS Fusion sidebites and Takayama center box, fins all included. 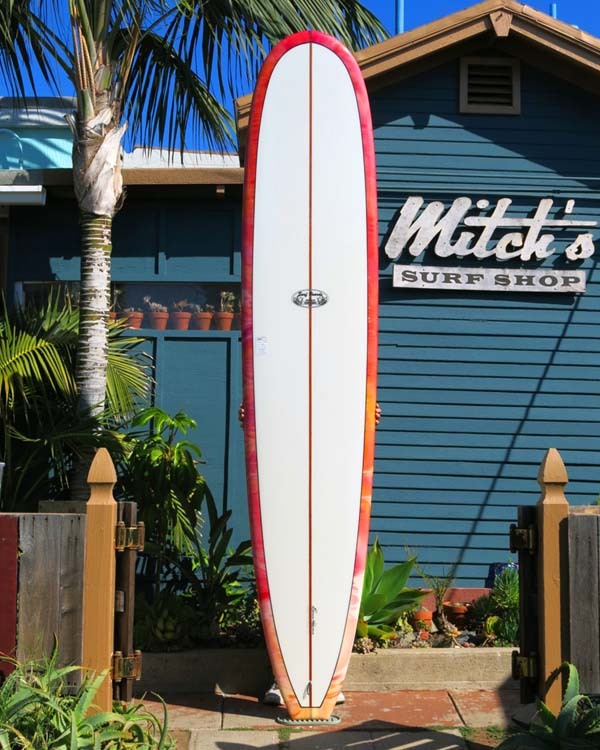 Length: 9' 6" Width: 23" Thick: 3 1/8"
Nose: 19 3/4" Tail: 14 1/4"
Donald's ultimate high-performance noserider, the In The Pink is a modernized, performance version of the NR-2. 60/40 rails and a noserider style rocker, squaretail. Able to handle anything from ankle to overhead barrels. Made by Hawaiian Pro Designs in California USA. IN STOCK NOW at our LA JOLLA shop.